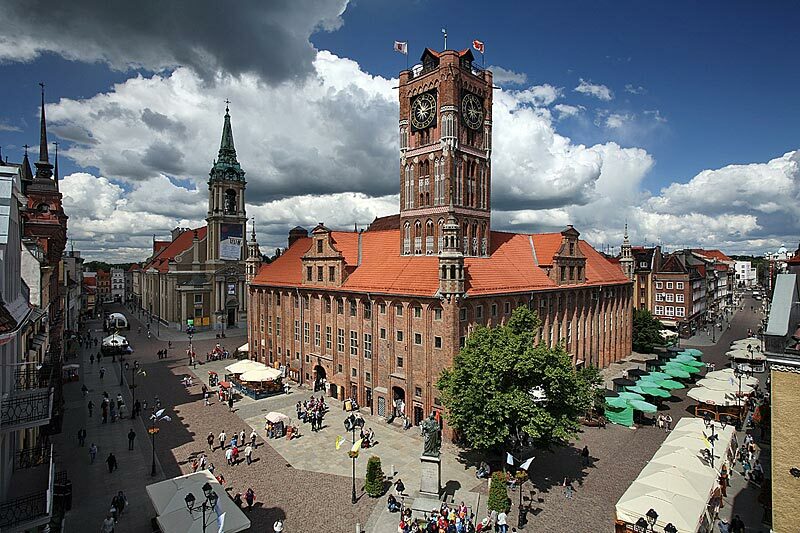 The Town Hall in Toruń is one of the largest brick buildings of that kind in Europe and the most important historical monument within the Old Town of Toruń. For centuries it served as the administrative and commercial hub of the city. Numerous trade fairs, homage ceremonies, knight tournaments or even public executions took part in the vicinity of this imposing edifice. The Town Hall was erected in the Gothic style at the end of the 14th century incorporating in its structure a tower which had been built over a century before. The tower was additionally raised and was crowned with a pointed-helmet spire. The original building was a two-storey structure with a spacious courtyard, modeled on the best examples of the Flanders architecture. Every day, its interior filled with a crowd of hucksters, merchants, traders, town councilors and pickpockets. The tower housed a treasury, the town archive and a prison, and the basement was used as brewery and wine cellars. On the ground floor there were cloth halls, bread stalls, dozens of little stalls and a courtroom, whereas the first floor contained the town council conference room and the Grand Hall which was frequently used a reception hall for Polish kings. For one of the kings, John I Albert, the Town Hall became in 1501 the site of his premature death. The king’s heart, who was said to be fond of the beauty of local women, was buried in SS. John’s cathedral. In 1602-1603 the Town Hall underwent a thorough reconstruction in the Mannerist style, receiving another storey and decorative stonework features such as sandstone corner turrets and beautiful window jambs. The Flemish architect Anthonis van Obbergen, who designed the reconstruction, preserved the Gothic character of the edifice despite the modifications. In 1645 the Town Hall became the venue of religious discussions known as Colloqium Charitativum, which were an attempt to work out a compromise between representatives of conflicted Christian denominations. The most tragic event in the history of the Town Hall in Toruń was the great fire which broke out in 1703 as a result of shelling by the Swedish army who lay siege to the city. The fire completely destroyed the roofs and all the interiors above the ground floor. However, the brick walls remained, which allowed for the further reconstruction carried out in the 18th century. The traces of the ravaging fire are still visible on some charred bricks of the tower. The tower itself lost its tin helmet-roof, which has not been reconstructed since. Until mid-20th century, the Town Hall was the seat of municipal authorities, however, in the course of its history its chambers occasionally served even as military hospital. Today, the building houses the District Museum. In its interiors visitors can admire historical furnishings and learn about the functions of the particular rooms, as well as see the exhibitions of Gothic art, local handicraft, and 19th and 20th-century Polish paintings. The Town Hall also has an interesting legend which claims that the edifice was constructed so that it resembled a calendar. The tower stands for one year, the four gates reflect the four seasons, twelve large halls correspond to twelve months in a year, and the number of windows is supposed to be equal to the number of days in a year. The legend has it that the burghers added yet another window in leap years so that the architectural calendar was correct. Today, few people attempt to prove the correctness of the legend, it is far more pleasurable to admire the carved figures of townsfolk from past centuries, which were based on the images depicted in one of the sacral paintings in a Toruń church. Climbing the town hall tower also provides unforgettable experience and the view of the historical city and the Vistula river flowing along its walls is truly breathtaking.